When Louisiana Gov. Bobby Jindal took office eight years ago, state taxpayers provided 60 percent of the funding for the state’s public universities. Now, taxpayers put up barely a quarter of the tab, leaving students and their families to cover most of the gap in the form of rising tuition and fees. The scope of Louisiana’s disinvestment is both startling and unique. The national recession that began in 2008 forced every state in the union to cut money for colleges and universities, but most have reversed course with an improving economy. Not Louisiana, which, according to national surveys, has cut higher education funding more than any other state since the slowdown began. State aid to universities here has been slashed by 55 percent. 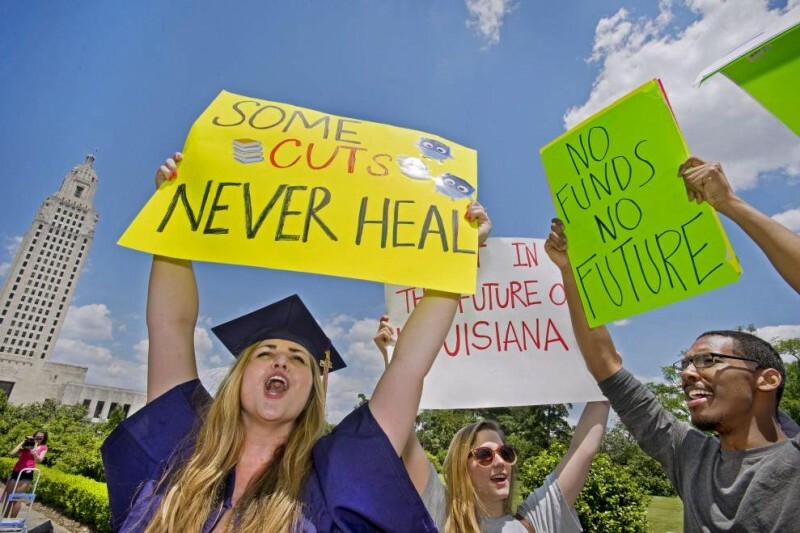 In making those cuts, Jindal and the state Legislature reversed more than a decade of bipartisan efforts to raise the profile of Louisiana’s universities. His two immediate predecessors, Kathleen Blanco and Mike Foster, made higher education a top priority, citing the Pelican State’s woeful rankings in educational attainment. And in 2007, Louisiana, for the first time, reached the Southern regional average in its support for universities. Those gains have now unraveled. Large tax cuts, generous subsidies for certain industries and collapsing oil prices have led to deep annual budget cuts. And higher education funding has been among the most vulnerable targets for the scalpel, lacking the constitutional protections enjoyed by some other top priorities, like K-12 education. The brunt of the financial pain of the state’s cuts has been absorbed by students. To make up for lost money, Louisiana has lifted tuition and mandatory attendance fees faster than any other state over the past five years. At the University of Louisiana at Lafayette, mandatory fees and tuition have shot up by 140 percent since Jindal took office, going from $3,430 to $8,244 per year. In part because of the rising cost, more students are opting not to seek bachelor’s degrees. Louisiana was one of only six states to see a decrease in university enrollment between 2009 and 2014, according to the State Higher Education Executive Officers Association. Owing to tuition hikes and tougher admission standards at universities, far more Louisiana students are choosing two-year schools than they were eight years ago. Though Jindal called for precisely such a shift, aid to community and technical colleges also has been slashed on his watch. 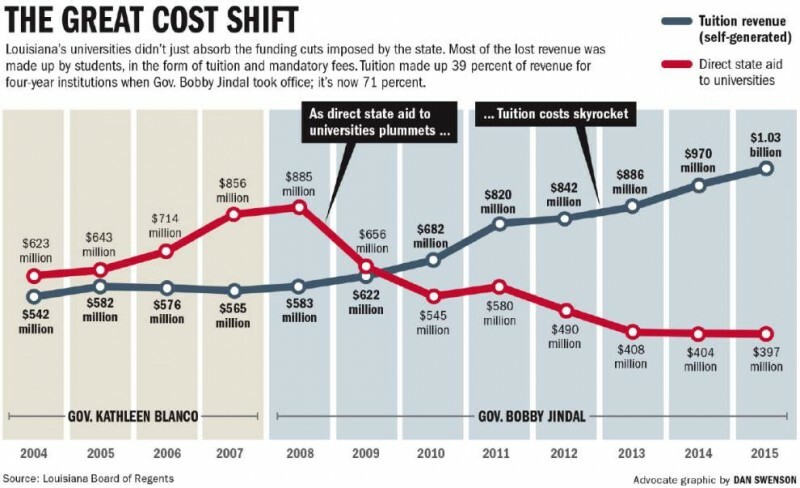 On a per-student basis, those schools now get about half as much state aid as they did when Jindal took office. University officials have complained about the cuts, but the schools haven’t suffered catastrophic losses, thanks to steep tuition hikes. The operating budget for state universities of about $1.4 billion is down by just $40 million since 2008, though, adjusted for inflation, that amounts to a 13 percent cut. At the University of Louisiana at Lafayette, mandatory fees and tuition have shot up by 140 percent since Jindal took office, going from $3,430 to $8,244 per year. Some schools have been hurt more grievously than others. For LSU, the cuts have meant putting the school’s aspirations to greatness on ice, rather than actually shrinking its budget. At the other end of the spectrum, the University of New Orleans has waned dramatically and has seen its budget gashed by almost 20 percent, leaving the state’s largest metropolitan area without a high-functioning public university. With tuition rising faster here than anywhere else in the country, qualifying for Louisiana’s merit-based scholarship program — the Taylor Opportunity Program for Students — matters more than ever. But the benefits are not spread equally. At LSU, more than 95 percent of the roughly 4,400 in-state freshmen receive TOPS scholarships; at Southern University at New Orleans, the number of freshmen on TOPS usually can be counted on one hand. The distribution of TOPS benefits is uneven in other ways. White high school graduates are almost three times more likely to receive TOPS than their black peers, and three-quarters of recipients come from families who earn more than the state median income of roughly $40,000. Louisiana’s historically black universities are reeling, because of both cuts in funding and higher admission standards imposed by the state. Enrollment at the state’s three four-year public HBCUs is down by a combined 15 percent since 2008. Moreover, the overall number of black students attending Louisiana universities of any kind is down by 8 percent since 2008. Compared with some peer states, Louisiana has too many universities — including many in close proximity to one another. Florida, with four times as many people, has 12 public universities, two fewer than Louisiana. Most of the 14 schools, meanwhile, field athletic teams that lose jaw-dropping sums of money. Every NCAA-affiliated athletic program at a Louisiana public university is in the red save for that of LSU, whose football and baseball teams make money. Some schools spend almost a tenth of their budgets propping up sports programs. The Jindal administration sought to move away from a long-standing system of funding universities that rewarded enrollment above all. However, the reforms have been undone by the state cuts in direct aid, which have reduced the state’s leverage and made capturing tuition dollars more important than ever. In presiding over nearly a decade of cuts, Jindal — famously an Ivy Leaguer and a Rhodes scholar — steered Louisiana off the course mapped out by two of its most college-friendly governors: Blanco, a Democratic centrist whose policies Jindal scorned, and Foster, a pro-business Republican who helped establish Jindal’s career. The about-face wasn’t the first in a state that has had a fickle relationship with its universities. Louisiana was late in making higher education a priority. In 1925, when LSU moved from downtown Baton Rouge to a plantation in southern Baton Rouge, the state’s flagship school was a sleepy academic backwater. Huey P. Long sought to change that in the 1930s, bringing an idiosyncratic enthusiasm for LSU that has become legendary. Under his watch, the university’s budget quadrupled. It hired star professors, built a giant new football stadium and established a medical school in New Orleans. Long wrote songs for the band and drew up plays for the football team. In a famous radio address, he ticked off a list of the country’s great universities and placed LSU among Harvard, Yale and Johns Hopkins. But the truth is that Louisiana was behind in Long’s time, and although the state has made progress since then, Louisiana still lags behind its peers in educational attainment. Only West Virginia and Arkansas have a smaller percentage of working-age adults with some kind of college degree. Among black people, the state fares even worse. Just 18.9 percent of black Louisianians have a college credential, the lowest rate in the country. And since Long’s day, the case for higher education has only grown more urgent. Industrial economies around the world continue to shift away from manufacturing toward jobs based on knowledge. A clear path to a college degree may be the closest thing to an equalizer in a nation that prides itself on social mobility. Census figures show college graduates earn on average about 76 percent more than high school graduates — and the disparity is increasing over time. In 1940, fewer than 1 in 20 adult Americans had college degrees; roughly 1 in 3 do today. But if there’s a consensus that higher education has value, Louisiana’s willingness to invest in it has waxed and waned ever since Long’s time, largely in step with the state’s boom and bust economic cycles. Data compiled by Tom Mortenson, a senior scholar at the Pell Institute for the Study of Opportunity in Higher Education, show that Louisiana often has been among the most generous states in funding higher education over the past century, as measured against residents’ income. But the flush 1960s and 1970s gave way to the oil bust of the ’80s, and Louisiana’s investment dried up. By 1989, it had fallen to No. 32 among the states on this metric. It would remain around that level until Foster took office in 1996, promising to make higher education a priority. Under Foster and his successor, Blanco, Louisiana climbed all the way back to No. 6. But with the cuts of the recent years, it has slid back to 24th place in less than a decade. That’s despite the fact that many other states also were paring back support for higher education over the same period — and that students in Louisiana, a relatively poor state, rely more on publicly funded institutions than their peers elsewhere. Rich states in the Northeast, like New Hampshire, have never invested much in higher education, partly because their residents are more likely to attend private and out-of-state schools. Few Louisianians, by comparison, go away for college, and outside of New Orleans, there are few private universities in the state. Educating residents here is largely a job for state-run colleges. Jindal did make progress on a couple of the more vexing challenges facing high education in Louisiana — poor graduation rates and low admission standards — though even those efforts are starting to feel the strain of budget cuts. Graduation rates are based on the proportion of freshmen who complete their degree within six years, and Louisiana has never put up standout numbers. In one recent year, the graduation rate at SUNO fell to 5 percent — among the lowest in the nation. Even the flagship has struggled. A decade ago, graduation rates at LSU were barely more than 60 percent, far lower than at most peer institutions. Louisiana’s historic openness to all comers was partly to blame. Until the late 1980s, all of the state’s four-year colleges allowed anyone with a high school diploma to enroll, a policy with roots in Longism. The governor craved prestige for LSU but also abhorred exclusivity. As equitable as the open-door approach was, critics argued that it steered too many underqualified students into four-year schools, setting them up for failure — hence the low graduation rates — and inflating costs. As a rule of thumb, the expense of teaching a student at a four-year school is roughly twice as much as at a two-year school. Jindal tried to change that practice. Admission standards, which were first imposed at LSU in 1989, have gotten tougher across the board. And in 2010, the Legislature passed the Jindal-backed GRAD Act, which sought to give universities more autonomy — to raise tuition, for instance — while further hiking their standards. Universities that met the act’s goals would be rewarded with more state aid. Among other changes, the new law barred four-year schools from admitting students who needed any remedial classes. The reforms improved some of Louisiana’s woeful metrics. Graduation rates have notched steadily upward. Almost half of Louisiana collegians now graduate within six years, up from 43 percent when Jindal took office ­— though Louisiana still has the second-lowest graduation rate in the South and the fifth-lowest in the nation, according to the Southern Regional Education Board. The mix of students in four-year versus two-year schools also has steadily tilted closer toward national and regional norms as more students are routed to community college. A 2003 paper by the Public Affairs Research Council of Louisiana noted that 76 percent of Louisiana’s freshmen then attended four-year schools, well above the regional average of about 60 percent. By the time Jindal left office, that figure was down to 64 percent in Louisiana. Still, Louisiana backtracked on some of its key reforms before Jindal’s tenure was over. Giving schools the leeway to raise tuition and basing their state aid on their performance, rather than on a head count, was supposed to ease the pressure to recruit as many students as possible. But cuts in direct state aid have more than offset the tuition hikes, leaving many campuses as desperate to bring in more students as they ever were. Last year, the Board of Regents voted to allow some universities a two-year break from the new admission standards, a step aimed at helping them enroll more students to make up for lost money. Things only got worse during Jindal’s last legislative session, when he persuaded the Legislature to go along with an unusual budgetary sleight of hand to stave off massive new cuts to higher education. The gambit, built around a phantom tax credit, was designed to keep Jindal faithful to a pledge he had signed promising not to raise taxes. But as a side effect, it tied university funding to head counts more directly than ever. It was a lamentable outcome, in Scott’s view. The reforms Jindal pushed were mostly low-hanging fruit, costing little, if any, money. Since his first year, the overarching imperative has been to spend less — which may explain why Jindal slashed the state’s modest spending on two-year colleges even as he sought to champion them. Jindal found himself short of money every year after his first, thanks mostly to an income tax break he signed off on in 2008, when the state was flush with proceeds from the Hurricane Katrina recovery. An economic funk followed, and ever since, the state’s budget has been on marshy ground. Louisiana spends about $25 billion per year, but close to 90 percent of that is money the state is required to spend on things like debt service, housing inmates, benefits for state workers and satisfying federal mandates. Higher education spending has no such set-aside — it is discretionary — and it often has proven the easiest place to make cuts year in and year out. Plus, there was an obvious place to turn to make up some of the money colleges were losing: students. Mindful of the state’s relative poverty and its low educational attainment, Louisiana officials had historically made sure to keep tuition down. Although the state had some of the lowest tuition rates in the country in 2008, they have been steadily going up under the terms of the GRAD Act, to the point they are now in line with the regional average. At two-year schools, tuition now exceeds the regional average. But rather than pumping the proceeds back into the schools, as administrators had hoped and expected, the state engaged in a “tuition swap” — taking just as much out of university funding as the higher tuition brought in. The cost of the tuition hikes — among the steepest in the nation — hasn’t all been borne by students. Because state TOPS scholarships completely cover tuition for eligible students at state schools, the price tag of TOPS has risen in tandem with the tuition hikes, going up by 110 percent in eight years. Still, two-thirds of university students are not on TOPS scholarships, and the higher tuition they pay helps the state offset losses elsewhere in the budget. In an interview with The Advocate, Jindal defended his record, insisting repeatedly that he “made funding higher ed a priority” and noting that, for the schools, the tuition hikes largely made up for the cuts. But he also sounded a note of regret, saying higher education often was his only choice for cuts and suggesting that he might have looked elsewhere if he could have. While the tax cuts of 2008 set Louisiana on a shaky financial path, Jindal’s national political aspirations hamstrung him further. He was keen on getting a seal of approval from the powerful Washington lobbying outfit Americans for Tax Reform, whose anti-tax pledge he had signed. He consulted with the group frequently as he tried to balance budgets awash in red ink. In the end, staying in the good graces of Americans for Tax Reform not only meant Jindal couldn’t pursue new sources of revenue; it also meant he couldn’t simply end costly corporate tax giveaways — even those his own administration had concluded were wasteful. So great was the governor’s devotion to the pledge that he threatened to lop another 82 percent from what was left of Louisiana’s support for higher education last year unless the Legislature passed his unusual tax swap. Practically speaking, going along with cuts of that magnitude would have taken Louisiana out of public higher education. Lawmakers grudgingly went along with Jindal’s bill so as to preserve what they could. “I think there were other goals in place that were more important to some folks than higher education,” said state Sen. Jack Donahue, a Mandeville Republican who leads the Senate Finance Committee and who sparred with the governor over tax giveaways. This story is part of a series that appeared in The Advocate of Baton Rouge, and is reproduced by permission. Read the rest of the stories in the series here.